I’m very lucky that I get to use and test some great outdoor products. Some, of course, fall by the wayside and never make the cut because, in my heart of hearts, I don’t believe in them. If I don’t believe in them, I can’t recommend them. Simple. Fortunately, the vast majority of products I get to test I’m more than happy to use when I’m out adventuring with family and friends. 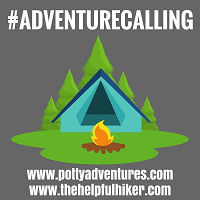 They do their jobs well, they are sufficiently robust to thrash around realistically outdoors in inclement weathers, and they’re priced competitively for the role that they play in our adventures. However, on occasion, a product comes along that, despite my ridiculously high expectations, is so good that it doesn’t just surpass my lofty preconceptions, it smashes them out of the park. Cue the Lowepro Whistler Backpack 350 AW II smashing everything I could throw at it out of the rather beautiful, but gnarly, Sierra Nevada National Park. Lowepro have been a brand that I’ve admired from a distance for some time now. Having known, for many years, that they were the go-to choice for many adventure photography professionals, it was almost as if I couldn’t justify the outlay, not because of the products themselves, but rather because my photography equipment and skills, in my mind, never warranted a pack built to such exacting standards. Now, I’m not suddenly announcing to the world that a new demi-god-like photography superstar in the shape of me has suddenly descended from the aperture heavens – far from it. But as my blog has grown, and as my interest in capturing the very best moments from both our family adventures and my personal escapades has developed, I now categorise myself as a keen amateur photographer. I’ve even hooked up on occasion with a local professional photographer who, in return for my guidance up a mountain, has shared some of her top tips, which have helped to progress my passion for taking and sharing images further. As well a burgeoning Instagram portfolio (come on, if it’s not on the gram did the adventure really even happen? ), the other thing that has been proliferating over the last couple of years is my collection of camera and video making equipment. For the first time in my life, as a Nikon dslr owner who also uses the latest GoPro to capture us on the move, who has a wealth of funky accessory add ons including tripods, 3-way extending arms, spare SD cards and lithium batteries, a portable hard drive (because when I finally manage to capture a damn ‘lit tent at night photo’ the last thing I want to do is lose it haha) and enough leads and cables to act as guy lines on my mountain tent, I now NEED a bag to house it all safely when I’m exploring the great outdoors (or a mountain champagne bar!). The problem, as I see it, is that a lot of camera bags on the market seem to be designed to shoot weddings. That’s not me being flippant…some of the best photographers I know shoot weddings…it’s just me pointing out that if you take Lowepro out of the equation, there’s not an awful lot left designed for both true adventure and to safely stow your average photographers or content creator’s photography and audio-visual gear. 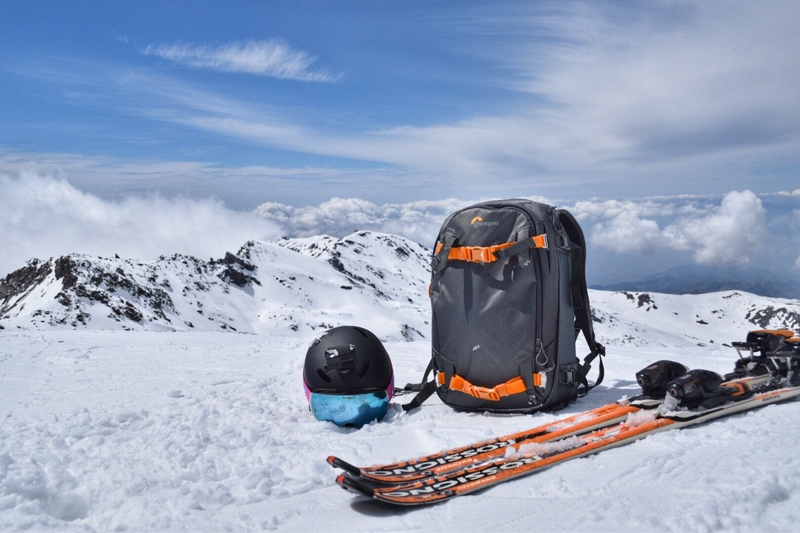 So, the Lowepro Whistler Backpack 350 AW II is, primarily, a snow-specific pack aimed at skiers and snowboarders who like to push the limits but who also want to capture every last second of it. Now, bearing in mind that it’s not exactly a featherweight, it’s not particularly low profile and it isn’t cheap; this pack must do an awful lot of things tremendously well to justify you heading out to the shops to bag yourself one. It does and more. The first thing to explain about this bag is its build quality. The Lowe family, as I’m sure many people with a vertical climbing inclination already know, know a thing or two about creating top quality backpacks. However, heritage alone (as good as this one’s is! ), shouldn’t draw you to parting with your well-earned money. Thankfully, here on the Lowepro Whistler Backpack 350 AW II, that climbing royalty heritage of theirs is put to damn fine use. This bag has literally been designed to perform in some of the harshest conditions you could ever imagine. Now, as much as the blue skies and sunshine that I tested this bag in for much of the week in Sierra Nevada were a joy, check out this video where I took it out into a snowstorm, with winds gusting between 50 – 60mph, to see how useable and withstanding of the elements it was in the high mountains. As you can see from the video, the Lowepro Whistler Backpack 350 AW II simply laughs in the face of bad weather. When people claim that outdoor gear is robust, I usually raise an eyebrow. I’ve broken, ripped and cracked more stuff than I care to remember or admit. However, the 420 Nylon Ripstop with a TPU\PU dual laminate that the backpack is constructed from isn’t just waterproof, it bombproof. This has some SERIOUS abrasion resistance and tear strength and offers genuine 4-season protection on any continent. Add to this the combination of inbuilt and internal removable padding that envelopes the entire bag like some sort of foam ribcage protecting its vital organs, and you definitely have the MOST solid bag I’ve ever had the pleasure of using. As such, the fact that it’s no Skinny Minnie, as I alluded to earlier, doesn’t matter one bit. This bag isn’t designed for ultralight adventures. It’s designed to keep you and your expensive equipment safe from harm when you’re deep in the wilderness and facing the harshest of conditions. Speaking of the foam protective padding, I took a pretty epic tumble after clipping some ice a couple of days into testing this pack. The remarkable thing, apart from the fact that every single piece of camera and video equipment that I was carrying remained as good as new as I skidded a few hundred feet down a slope at a daft speed, is that despite falling onto my left side and then being thrown onto my back in pretty violent fashion, not once did I feel anything inside the Lowepro Whistler Backpack 350 AW II coming into contact with my back. To put that into perspective: I crashed on skis at somewhere between 50 – 60 mph on hardpacked ice whilst having a full size digital SLR camera, GoPro, tripod, and various attachments and screws strapped to my back and I wasn’t aware of any of them during or after the crash! This bag is a beast! This level of protection for both your equipment and your body certainly gives the Lowepro Whistler Backpack 350 AW II the WOW! Factor. However, all of that protection is of little use if the backpack itself is not very useable. 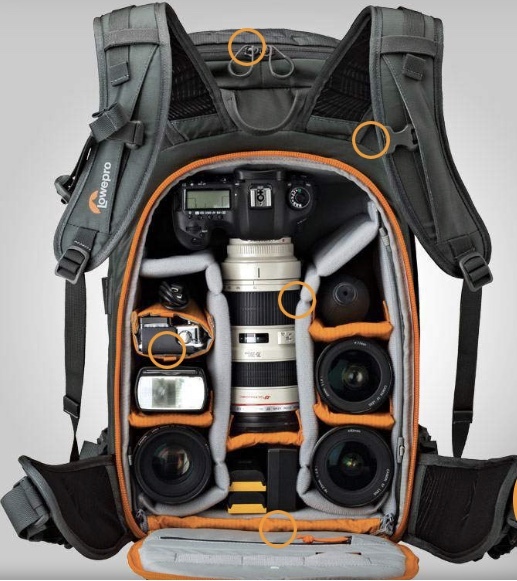 Again, Lowepro have thought of everything. First up we have the truly epic zips to the main compartment which, even as a wearer of mitts (forgive me…my hands get cold), are easily operated. As you’ll have seen in the video, I undid the whole main compartment with one hand while wearing said mitts and videoing with the other hand! Not usually an easy feat in blizzard conditions! Not only are the zips mitt friendly but the buckles are too, meaning no more cold hands when you stop to grab your camera. The next thing to point out is that, as a true outdoor backpack, the Lowepro Whistler Backpack 350 AW II doesn’t just designate a bunch of space for your digital memory recorders and forget about everything else you might need to carry. Oh no. As well as carrying the usual jackets, hats, spare gloves etc that you might expect it to gobble up, the Lowepro Whistler Backpack 350 AW II will also carry alpine essentials such as a shovel, probe, trekking poles, ice axes or, as you can see, skis or a snowboard for reaching those peaks and off-piste bowls only accessible one foot. This is quite simply the best backpack for those wanting to take their camera and video equipment out on adventures that I’ve ever had the pleasure of using! Furthermore, if, in the course of your adventures, some of your outer gear gets wet (we’ve all been there on those days where you rotate jackets because of persistent heavy rain for hour on end), don’t despair because the Lowepro Whistler Backpack 350 AW II has a large compartment, separate from the main storage section that houses your pride and joy camera equipment, that has a drain hole in the bottom. Stowing your wet, muddy gear on the move made easy. Speaking of being wet, although I couldn’t conceivably imagine the ridiculously tough exterior body of the Lowepro Whistler Backpack 350 AW II succumbing to snow intrusion, if you’re using this pack away from the slopes and encounter one of the thunderous hours-on-end rain storms mentioned above, the backpack also comes complete with an all-weather cover to sling over it with ease. As much as the Lowepro Whistler Backpack 350 AW II is a serious, highly technical 4-season snow pack, I can’t tell you enough that I’ll be sporting this bag everywhere from now on. Anytime that I have the urge to pick up my SLR, tripod and GoPro, whether that be on my next ski trip or much closer to home on our regular jaunts across the mountains of North Wales, this bag will be coming along. I’ll be putting its 4-season credentials to very good use by donning it throughout the spring and summer here in the National Parks of the UK and it’ll be the first pack I opt for when the weather turns. It has quite simply changed my perception of camera bags and I expect that it’ll be a faithful friend on many, many future adventures. It looks great, outperforms anything I ever come across with the same functions and is, quite simply, the best bag that I know of for wilderness photography adventures. ← Happy Mother’s Day – Sorry I Can’t be There!